How much do full mouth dental implants cost in Mexico vs US? What are different types of full mouth dental implant procedures? How do you estimate the cost of your dental implants? Can I save on the cost of dental implants in Mexico, even with travel expenses? By definition, full mouth dental implants replace an entire upper or lower arch. A full set of dental implants for each jaw consist of 2-8 implant post. Those implants anchor a snap on denture of fixed prosthesis. However, you can get single tooth dental implants to fill in remaining gaps between your teeth. The dentist will place dental crowns on the rest of the teeth for full mouth reconstruction. 1. Prerequisite Procedures: Do you need multiple extractions and bone grafting? You have to include the cost of extractions if you are replacing your damaged permanent teeth with a full set of dental implants. The cost of extractions is typically $60 – $80 when you get dental implants in Mexico. Dental implants require good jaw bone. You may need bone grafting due to bone loss. Bone loss typically occurs as you age, especially if you are wearing dentures. Although bone grafting is not the significant part of the total cost, your dentist in Mexico may include these costs if required. Regular bone grafting cost approximately $100 – $400 per jaw (for full mouth implants). For severe bone loss, you may need more extensive procedures such as block grafting. Likewise, you may have to undergo IV Sedation during your dental implant surgery. If you do, your dentist may need you to get blood tests. This patient just completed her full mouth implant procedure in Mexico. It’s amazing how full mouth dental implants can change one’s smile and confidence! The cost of full mouth dental implants depends on the number of dental implants per jaw. 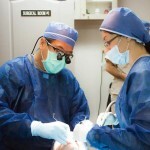 Get a consultation with your American or Canadian dentist before getting dental implants in Mexico. You will need the number of dental implants to get an estimate. The number of dental implants will depend on the strength and thickness of your jawbone. If you are on a budget, he can recommend the minimum number of implants to support full mouth of teeth. He can also recommend the optimal number of dental implants for different types of full mouth dental implants. The mouth has 28 teeth (excluding wisdom teeth), 14 on each jaw. Your dentist will not install 14 dental implants on each jaw. That’s overkill and not workable, medically. The most is 8 dental implants per arch. The minimum is 2 dental implants. The prosthetic (denture or fixed bridge) becomes more stable as you increase the number of tooth implants. The price also goes up with each additional dental implant. The cost of each dental implant in Mexico is approximately $780 – $855 per titanium implant post. 3. Which type of full mouth dental implants do you need? – Implant Dentures, Fixed Bridge, or All on 4. This full arch implants require 6-8 dental implants per jaw. This full arch implants require 4-6 dental implants per jaw. The most common type of full mouth implants are the Overdentures supported by 4 implants per jaw. Overdentures are the most cost effective type of getting full mouth dental implants in Mexico. These are special dentures that snap on to dental implants. You can remove them yourself to clean them. They give you that perfect Hollywood smile, and you can eat just about anything. Implant supported dentures typically need 2-4 implants per jaw. In Mexico, the most common whole mouth dental implant procedure is Overdentures with 4 dental implants. Fixed Bridges are often referred to as hybrid dentures supported by implants or fixed teeth supported by dental implants. As the name implies, you can’t remove the teeth yourself. This is like having a series of dental bridges in the entire mouth. Only your dentist can remove the teeth during your regular dental cleaning visits. Typically, a full arch fixed bridge requires 6-8 titanium implants posts in the upper or lower arch. All on 4 is a full set of dental implants that allows you to have a fixed denture, similar to the Fixed Bridge. 1. Type of Implant. All on 4 dental implants uses a tilted type of dental implants on your front teeth. A Fixed Bridge uses standard vertical dental implants. 2. Immediate Loading. Your Mexico dentist can anchor the temporary denture to the implants during your surgery. With Fixed Bridges, you wear removable dentures after the surgery. Then, you have to wait 3-4 months before you get your permanent teeth anchored to the implants. How much can I save by getting full mouth dental implants in Mexico with travel costs? This is an example of a full arch fixed bridge. This patient traveled to Los Algodones , Mexico and saved $20,000 on his dental work. How can you save $33,000 by getting full mouth dental implants plus two dental vacations in Cancun, Mexico? Even with travel costs, you’ll still save significantly. Here’s a sample cost scenario of getting full mouth dental implants in Cancun, Mexico. We give an example of a client who is getting a full mouth Fixed Bridge with 6 implants, while getting a vacation in Cancun. To finish the procedure, you have to travel twice with 4 months of healing time in between. Here’s how to calculate your savings. You still save $32,810 on your full mouth dental implants in Mexico, even with two dental vacation trips to Cancun, Mexico. All the estimate prices above include the titanium implant posts, abutments, connectors, and the permanent teeth. Are there dental package deals for the cost of full mouth dental implants in Mexico? I doubt you can find a full mouth dental implant deal in Groupon. But you can ask your dentist for dental implant deals. Some run temporary promotions on the cost of full mouth dental implants. Travel to Cancun, Mexico for All on 4 dental implants for a package deal cost of $11,800 per arch. To inquire about this dental implant package, contact Dayo Dental at 877-987-3296 or send us a message. Top dentist in Mexico plan your full mouth dental implants using 3D Modeling. Bottom line: You can estimate your cost (and savings) by understanding the basics of full mouth dental implants. Most of the time, you save 50-70% on the price by going to a dentist in Mexico. With fixed bridges, your savings by going to a Mexico dentist could amount to the price of a brand new car. That’s a tremendous value proposition. However, you need to see an implant specialist with advanced skill level for full mouth dental implants. Here are tips on how on finding a dentist in Mexico for dental implants. For questions or inquiries about the cost of full mouth dental implants in Mexico, call Dayo Dental at 877-987-3296 or send us a message.